The Integrity™ V500 System ASSR module provides an accurate estimate of hearing threshold using sophisticated signal processing techniques to optimize response detection, along with fully automated search capabilities. The module provides user control and flexibility. Auditory Steady-State Response (ASSR) is a quick and simple electrophysiological measure producing frequency-specific information that estimates the behavioral pure-tone audiogram. As an objective measure, ASSR is well-suited for testing infants, young children, and other individuals unable to provide reliable behavioral responses. ASSR measurement is a valuable addition to any diagnostic test battery to aid in more effective clinical decision-making. Furthermore, with the results displayed in the form of an estimated audiogram, it provides a familiar and convenient tool to communicate the degree of hearing loss when counselling families. The VivoLink™ generates steady state chirp stimuli centered at 500, 1000, 2000, and 4000 Hz. 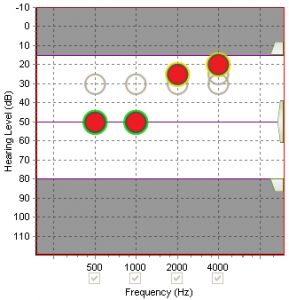 Multiple chirp stimuli in both ears can be generated simultaneously for faster testing, or presented one at a time for more accurate threshold estimation. Patented adaptive processing techniques, SOAP™ Adaptive Processing, are used to detect the ASSR response in the presence of noise and handle intermittent muscular artifact that typically makes ASSR detection difficult. Setting test parameters is intuitive, fast, and easy. With patients quiet and prone during testing, clinicians can simply select the frequencies of interest and proceed to run the test. As testing progresses, stimulus levels and frequency settings can be adjusted as desired. 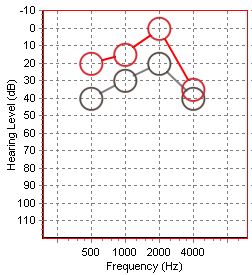 The system efficiently searches for thresholds following pre-defined protocols, and generates an estimated audiogram. There is no need to interpret results.